I had the opportunity to see an advanced screening of the new movie "Denial" last week. It was the night before Erev Yom Kippur and my wife tried to convince me to stay home and finish writing my Yom Kippur sermons. However, knowing my Kol Nidrei sermon was on the topic of bullying, and being familiar with the story of how Professor Deborah Lipstadt was bullied by a menacing, Holocaust denier, it seemed like a wise idea to see the film. And I was correct. There aren't many Hollywood feature movies that are made about college professors. The best of them can be counted on one hand: "Dead Poet's Society," "Good Will Hunting" and "A Beautiful Mind." 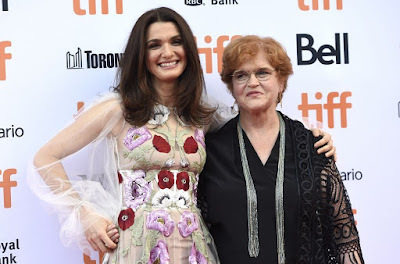 In "Denial," Rachel Weisz brilliantly plays Emory University Holocaust historian and author Deborah Lipstadt. The film is based on Lipstadt's book and focuses on her legal defense against a noted Holocaust denier, David Irving. I first encountered Professor Lipstadt during my undergraduate years when I took several Holocaust courses as part of my minor in Jewish Studies when I read her book and scholarly articles. I also had the chance to attend a lecture she gave at a Rabbinical Assembly convention, where I first met her in person. This was following her long trial in London after she had published History on Trial: My Day in Court with a Holocaust Denier -- her memoir of the experience defending herself against this libel charge from the Holocaust denier. I've since had the chance to talk with her on a few occasions and each time I feel blessed just to be in her presence. She's brilliant, charismatic and has arguably done more than any other Holocaust historian to ensure the Nazis don't get a posthumous victory. "Denial" a very well done film and even though we already know the outcome, there's a good deal of suspense throughout. The acting is excellent and Rachel Weisz, herself Jewish, does an Oscar-worthy job as Lipstadt. Believe it or not, Prof. Lipstadt had an uphill battle in defending herself against this libel charge. I know that seems ludicrous since the man who brought the suit is a well-known fraud, but because the case was brought in London the burden of proof was on the defense. Fortunately, there were enough generous donors who stood up and supported her legal defense including Steven Spielberg and Ohio's well known philanthropist Leslie Wexner, who was the first donor to step up and offered to fund her legal team in total. Wexner's right hand man, Bruce Soll, flew to London for the opening and closing of the trial (both men were congregants at my former synagogue in Columbus). Watching this film, it was clear that this wasn't a story in which the Holocaust was on trial. It was simply a case of bullying -- one that took place in quasi-academic articles and books written by Irving, a Holocaust denier and a self-admitted fan of Adolf Hitler. Irvin bullied Lipstadt throughout the entire process forcing her to prove she didn't break the law in trying to defend herself against the bully. The film begins after she published her book about Holocaust denial and debunks the theories of this British historian, who surmised in several books and articles that there was no systematic murder of Jews during the second World War and specifically that Auschwitz wasn't a death camp with gas chambers. Irving surreptitiously attends one of Prof. Lipstadt's lectures and challenges her on why she refuses to debate any Holocaust deniers. For the record, she cares deeply about free speech, but will not engage with someone who lies. She equates it to arguing with someone who says that Elvis is still alive. The Holocaust denier has someone record the exchange in which he completely catches her off guard and bullies her with name calling and threats. When Lipstadt is informed that he's filed a libel suit against her and the book's publisher Penguin in London, she chooses to take the more difficult road and defend herself against this bully rather than settle as some advised her to do. She could have easily backed down and allowed the bully to continue stomping on the graves of the six million Jews who perished in the Shoah, but she couldn't do that. She refused to settle and chose to defeat the bully using history and facts. Bullying is a serious problem and it's only getting worse. We see it in our political system, in the current election for president, and it's become an increasingly frightening situation with teens online. Judaism teaches us that words have significance. They are not merely words. Words do harm. We need to be rodfei shalom, pursuers of peace. We need to go out of our way for the sake of peace. We also can't be afraid to stand up against hurtful words -- the destructive language that tears down people. Prof. Lipstadt did just that. She stood up to Irving's hurtful words of bullying. Not only were his words hurtful to her as a serious scholar, but they were harmful to the survivors of the Holocaust. By denying the Holocaust, Irving bullied the survivors and their descendants, as well as all other Holocaust historians, who like Lipstadt have dedicated their careers to documenting the atrocities of the Shoah. I highly recommend "Denial" and, as the Jewish people begin the new year of 5777, I think we all need to commend Prof. Lipstadt for refusing to back down against this bullying Holocaust denier. She strongly underscored the adage, Am Yisrael Chai -- the Jewish people endure. Nice! Thanks. I have used her work in my classes as well. I want to see the film when it comes out. Hope that you and your family had good holidays.